Mike Wadhera is the founder of Teleport. After the dust settles, the real takeaway from Instagram’s cloning of Snapchat is that the connected camera revolution is just beginning. Instagram Stories sends a powerful message to hundreds of millions of people for the first time: No moment is too small to capture with your smartphone camera. A cult classic for many in the VR community, the 1995 film Strange Days shares a vision of a future where you could re-live a memory from the viewpoint of anyone equipped with a wearable recording device. You also could play back your own recordings whenever you chose and as often as you wanted. And when you played a recording back, you could follow the action with the freedom to look around. The technology as depicted in the film — which had a dark side to be sure — is far off, if ever fully obtainable. But in a world where no moment is too small to record with a mobile sensor, and one in which time spent in virtual reality keeps going up, interesting parallels start to emerge with our smartphones and headsets. Let’s look at how the future could play out in the real world by observing three key drivers: VR video adoption, mobile-video user needs and the smartphone camera rising tide. Virtual reality content can be created in two ways. The first is with 3D graphics authored in desktop software. This is how immersive content such as VR games and interactive experiences are made. Another approach is VR video, which captures moments of reality by recording the physical world with an array of cameras. At the low end is monoscopic (2D) 180° video; at the high end is stereoscopic (3D) 360° video. VR video also encompasses next-generation light-field video, which many consider to be the holy grail, enabling you to move around the scene freely without having your motions constricted. The important part is that no matter the format, pre-rendered VR video can’t reach the immersion of real-time 3D graphics — yet despite this fact, the adoption curve for VR video is staggering. Oculus recently announced that people had already watched more than three million hours of video in Samsung’s Gear VR. Even if you doubt VR video’s ability to deliver on the ultimate promise of the technology, the adoption for such a young medium is impressive. The oldest and most basic user need is immediacy, or the ability to access content in real time, which is rooted in our consumption of broadcast TV and radio media. This need helps explain the explosion of live video in the past 18 months, most notably the growth of Facebook Live and Live.ly. When people think about mobile video, they often start and stop at immediacy. As a result, immediacy features are often overvalued, in some cases to the detriment of usability. For example, Meerkat’s lack of playback greatly limited engagement on the platform. Today’s best mobile-video apps make you feel like you’re there watching, but tomorrow’s apps will feel like you’re participating. The continued push toward filtered social feeds has created greater demand for new ways to be authentic online. It’s the reason Instagram copied Snapchat and it’s often the key motivator for users adopting mobile video, as content is created in a spontaneous and unfiltered fashion. Beme is a great example of a mobile-video app designed specifically with authenticity in mind: videos are instantly shared, without preview (a black screen is shown when you start recording). Similar to disappearing messages, it’s a smart approach to subvert the curated self. 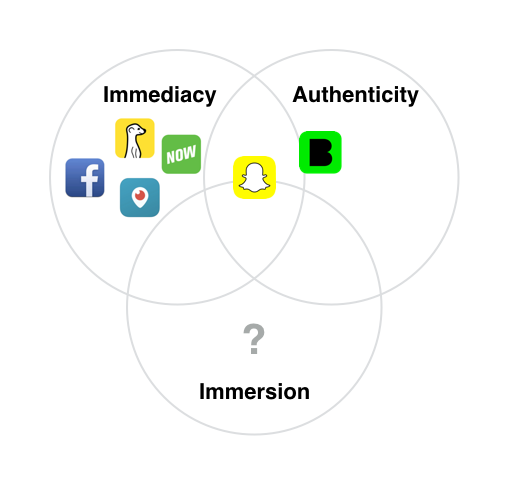 While authenticity is being at least addressed, immersion is being largely ignored. Today’s best mobile-video apps make you feel like you’re there watching, but tomorrow’s apps will feel like you’re participating via teleportation. Take, for example, Snapchat’s Story Explorer: When browsing a Live Story, you can “dive in” to the event by swiping up to see more Snaps from other perspectives. Could mobile-VR headsets such as Google’s Daydream bring the immersion to new heights? Snapchat could conceivably leverage built-in head tracking and controller technologies to let you jump around and even rewind or fast-forward in time. Today the content would be limited to 2D, but advances in underlying camera hardware could quickly change that. Apple has more than 800 engineers working across camera hardware and software teams. It’s rumored the next iPhone will feature a pioneering dual-lens powered zoom. 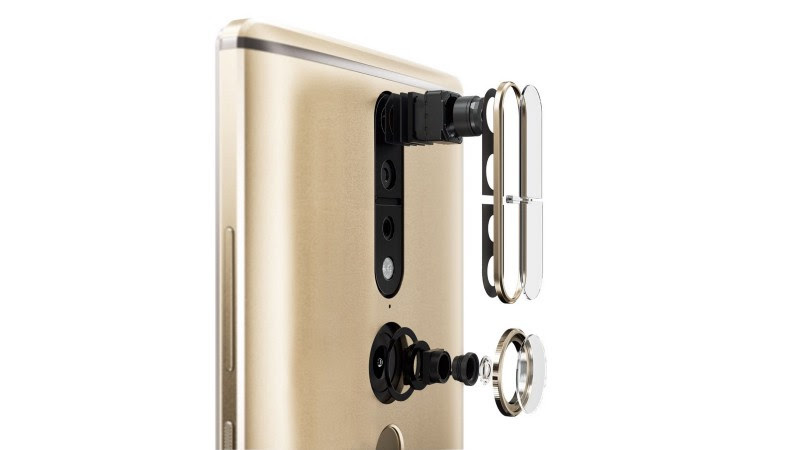 As the cost of components is falling and innovation is accelerating, the smartphone camera is being lifted by a rising tide of technology. Samsung has taken a wearables approach to VR video creation with their standalone Gear 360 camera. But is it unreasonable to expect integrated 360° video recording on an upcoming Samsung Galaxy smartphone? Fast-forward several generations of convergence: Could light-field video cameras come down orders of magnitude in cost and size, such that they could make their way on to our smartphones? This rising tide is great fuel for speculation, but one thing is for sure: When VR video capture becomes possible on mobile, the demand for VR video will meet the supply of billions of smartphone users who are now recording both big and small moments of their lives. This will be a major leap for the Experience Age and create a positive feedback loop between mobile and VR — which is one way virtual reality could shift from a promising demo to a truly mainstream technology. Get your camera ready.